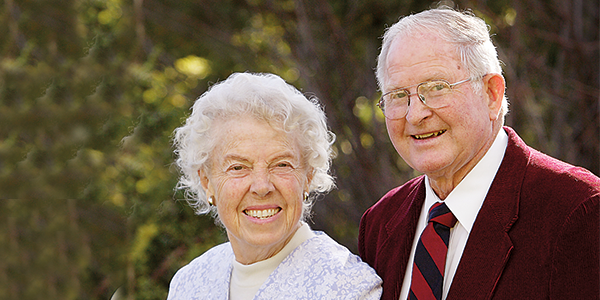 Edna Bauer and her late husband, Merritt '56, have been connected with Westmont for 65 years. They have given generously, remembering how much they struggled during Merritt's days as a student. They are charter members of the Wallace Emerson Society and have invested in the college by creating several charitable gift annuities over the years. "We were very poor in our early married life," Edna says. "The GI Bill helped, and we lived in a tiny mobile home near Ashley Road in Montecito." Merritt raised goats, worked as the campus photographer and cleaned and painted dorms during the summer. Edna managed the bookstore and soda fountain until Merritt earned his degree in education. After graduation, the Bauers spent four years working in elementary schools in Alaska and Northern California before returning to Santa Barbara in 1963. Merritt taught at Franklin and Peabody schools and retired in 1988 after 32 years in the classroom. Edna taught at Lincoln School, and then went into real estate with Century 21 in 1979. She has now retired. Edna recognizes that teaching is increasingly challenging. "It's so important to equip teachers with the strategies and attitudes they need to succeed," she says. Her most recent gift of one of her IRA accounts created the Edna and Merritt Bauer Scholarship Fund to assist students pursuing a teaching credential who need financial support. "I know Westmont students get a good education and will be grounded in their faith," she says. Jane Wilson, professor of education, appreciates the Bauers, who sought to make a positive impact on their students each day. "This gift will encourage aspiring young people to enter the noble profession of teaching," she says. "I hope their story will inspire others as they seek to give in meaningful ways." Reproduced with permission from the fall 2017 issue of the Toward Tomorrow newsletter. For more information about gift annuities and scholarship funds, please contact the Office of Gift Planning at (805) 565-6058 or giftplanning@westmont.edu.